Coming from someone who is in the process of self-publishing his first book, I know firsthand the importance of having a 2nd (or 35th) set of eyes to proof for errors and learn of ideas for improvement. Between writing, formatting, creating sell copy, developing a new website, and designing a cover, there’s a lot of opportunity for mistakes. And quite frankly, I’ve made them all. If it weren’t for friends and those willing to lend their support through Facebook and Twitter, my upcoming launch would be riddled with errors. But not everyone is so fortunate to have such a supportive community. For those launching a new product, service, or business and haven’t spent (see: wasted) quite so much time socializing online, where can they turn to find others willing to help work out the bugs? 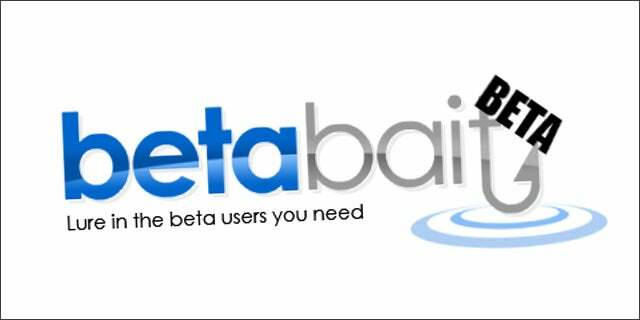 In their own words, BetaBait is “a place for startups to connect with early adopters who love new apps.” A daily e-mail is sent to those who’ve signed up as interested beta testers. The testers can then respond directly to the companies whose projects they find most interesting. Win, win. BetaBait has recently expanded its service to meet the surprising surge in demand from both sides. “We’ve decided both parties want more. So, we’ve created an online discovery platform as well. Here users can browse all the submitted apps, share them and leave real-time feedback. It’s growing and getting really exciting,” says BetaBait Co-Founder, Cody Barbierri. Barbierri and fellow co-founder, Rory Thompson, arrived at the idea for BetaBait based on frustrations from a previous startup they had attempt to get off the ground. In his opinion, Barbierri felt that there was too much emphasis in getting press in order to find interested beta users. In order to get an app off the ground, the product needs to demonstrate promise. In order to show potential, however, an app must be closer to the “finished” end of the development. If you’re interested in testing out new apps or having your new app be tested, stop by the BetaBait marketplace.